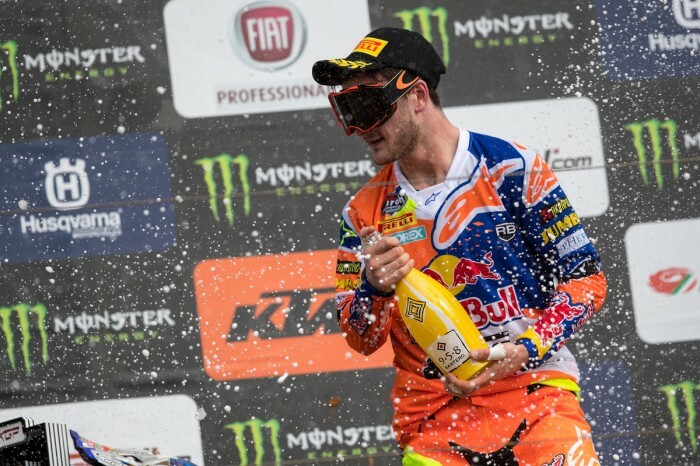 Following a comment he made for the TV cameras immediately after moto two criticising his team-mate Tony Cairoli for coming across him on the start straight, Red Bull KTM’s Jeffrey Herlings had toned down his opinion at the MXGP of Portugal’s post-race press conference. “It was a perfect weekend, perfect starts, it can’t be any better – same as last weekend and I just want to keep it going this way,” said the much more diplomatic Dutchman, making no mention of the Italian’s tactics. Agueda marked Cairoli’s 150th career podium but he knows he has work to do if he’s going to beat Herlings to this year’s title. The final step on the podium was filled by Team HRC’s former champion Tim Gajser whose comeback from injury continues to pick up pace.